Reba J. Hoffman is making her way across the country to help women make a positive change in their lives. 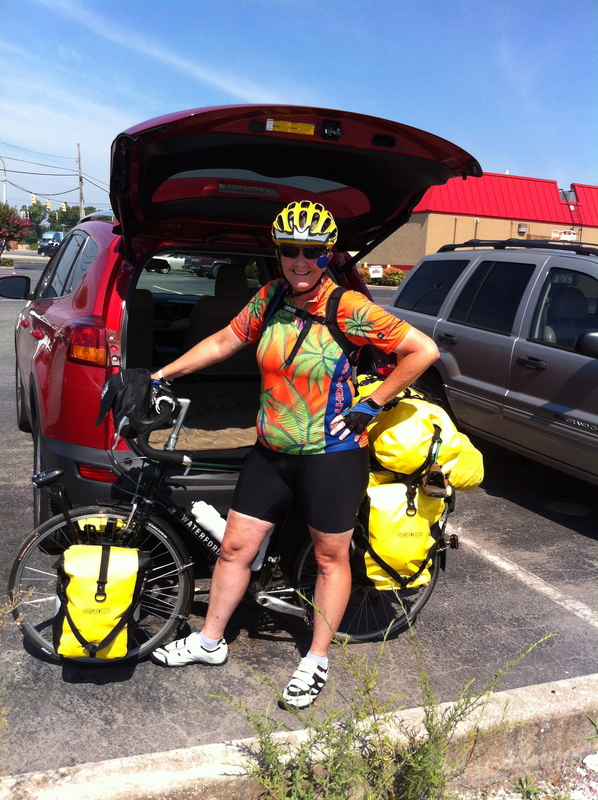 Reba J. Hoffman doesn’t know the route her bicycle is taking her as she heads to the West Coast. The life coach does know there is a purpose behind the pedaling. Huffman is traveling the Road to Freedom as part of her “Pedaling with Purpose” ride to help those who suffer Post Traumatic Stress Disorder (PTSD). Her tour took her to Corinth on Friday night to stay with friend Pat Trainum. Loaded with 50 pounds of gear on a custom-built bicycle, the 56- year-old searches for those crying out for help of a violent attack. A person such as a woman who hadn’t been out of her house in 17 years or a former abusive husband who was brought to tears with remorse after speaking with Hoffman. When it comes to helping victims of violent assaults, Hoffman leans on her own experience. On November 5, 1984, she was abducted in broad daylight by a drug-crazed criminal who had been out of jail less than 24 hours. Hoffman was beaten, raped and left for dead in a remote area of Florida. Hoffman is out to help those suffering from PTSD to face their fear and find the courage to seek help. Hoffman was able to overcome her pain and anxiety through the help of others. According to Hoffman, it takes a good team to move past the violent situation. • Following her blog and invite others to do the same. “They can spread it on social media,” she noted. • Purchase her book, “Facing Fear and Finding Freedom,” available for $2.99 on Amazon. “Give it as a gift to any woman needing to overcome fear that holds her back from accomplishing her dreams,” said the author. • Donate via PayPal (reba@magellanlifecoaching.com). Groups in the area who would like to have Hoffman speak while in the area, can contact Trainum at 662-415- 1149. ← What do you get when you combine a bicycle, a wiry woman of God and miles of open road with no compass? This is a re-post of an excellent article about Reba in a Corinth MS newspaper written by Steve Beavers. The photo is one I took before Reba left Huntsville.